What to do about The Flood Next Time | Watts Up With That? Note: The text of this essay is a bit long, even for me. It quotes a NY Times article, and I comment on it. The entire essence is contained in two simple posters at the end of the piece. Justin Gillis, the last bastion of the NY Times’ now defunct Environmental News Desk, wrote a pretty good news piece on 13 January 2014, entitled The Flood Next Time. While the gear today is of the latest type, some kind of tide gauge has been operating at the Battery since the 1850s, by a government office originally founded by Thomas Jefferson. That long data record has become invaluable to scientists grappling with this question: How much has the ocean already risen, and how much more will it go up? Well, the tide gauge equipment just helps us to know what the tides have been doing. The equipment there that is really helping us know how much the sea is coming up is the CORS GPS-based equipment which measures how much the land itself is moving up away from , or down towards, the center of the Earth. More about that later. The work starts with the tides. Because of their importance to navigation, they have been measured for the better part of two centuries. While the record is not perfect, scientists say it leaves no doubt that the world’s oceans are rising. The best calculation suggests that from 1880 to 2009, the global average sea level rose a little over eight inches. Tide gauges along the East Coast show a long-term increase in relative sea levels, in part because the ocean is rising and in part because areas of the coast are sinking. Mr. Gillis lays it, quite correctly, on the line: The land is sinking and the sea is rising. The oddest thing is that, although the scientists have spent a great deal of time and effort to quantify the amount of sinking and the amount of sea rising, Mr. Gillis doesn’t tell us, except in the vaguest of manner, either number. When he says “the best calculation” he is referring to the long-term overall global sea level rise believed to result from the Earth’s recovery from the Little Ice Age, or Global Absolute Sea Level , Global ASL, and widely accepted to amount to roughly 1.8 mm/yr pre-1960, and a bit more, up to 3.2 mm/yr, since then. I have no wish at all to take up the one paper claim that the Northeast Coastal US “will be a global hot spot for a rising sea level over the coming century”—the link to the paper should work – I have looked at it and they are not simply saying the NE US coast is sinking. Here is a tiny panel of eight long-term sea-level graphs for eight northeastern US ports. (I am not fond of predictions made by line-drawing on graphs). Clicking on the imaging should bring up full page version. All are from http://tidesandcurrents.noaa.gov/sltrends/ . That may not sound like much, but scientists say even the smallest increase causes the seawater to eat away more aggressively at the shoreline in calm weather, and leads to higher tidal surges during storms. The sea-level rise of decades past thus explains why coastal towns nearly everywhere are having to spend billions of dollars fighting erosion. The evidence suggests that the sea-level rise has probably accelerated, to about a foot a century, and scientists think it will accelerate still more with the continued emission of large amounts of greenhouse gases into the air. The gases heat the planet and cause land ice to melt into the sea. The official stance of the world’s climate scientists is that the global sea level could rise as much as three feet by the end of this century, if emissions continue at a rapid pace. But some scientific evidence supports even higher numbers, five feet and beyond in the worst case. I would not have been surprised to find a statement like “scientists say even the smallest increase causes the seawater to eat away more aggressively at the shoreline in calm weather” on a poster at the high school science fair I judged. I was surprised to find it printed in the NY Times. This would mean that the physical properties of water would have to change between high tide and low tides, for example. I publicly challenge Mr. Gillis to provide a direct quote or a source supporting the statement. As for Mr. Gillis’ last bit, “But some scientific evidence supports even higher numbers, five feet and beyond in the worst case.” he might have better said that there was some speculation about higher numbers. It is questionable to say that there is evidence about the far future – I for one would have thought a journalist would have known this important difference, imagine using this language in a courtroom. I am very surprised that Mr. Gillis doesn’t simply give us the GIA (glacial isostatic adjustment ) subsidence numbers, they are not secrets, after all. They come from the same people that give him and us the tide and sea level rise numbers – NOAA at their National Geodetic Survey, using long-term continuous GPS readings. Here’s the link è http://www.ngs.noaa.gov/CORS_Map/ Richard Snay kindly directed me to this page ftp://cors.ngs.noaa.gov/cors/coord/coord_08/nad83_2011_geo.comp.txt for the latest computed results which include vertical movement for a selection of CORS sites. (unfortunately, not this particular page for the Battery). The sinking is fastest in the Chesapeake Bay region. Whole island communities that contained hundreds of residents in the 19th century have already disappeared. Holland Island, where the population peaked at nearly 400 people around 1910, had stores, a school, a baseball team and scores of homes. But as the water rose and the island eroded, the community had to be abandoned. Eventually just a single, sturdy Victorian house, built in 1888, stood on a remaining spit of land, seeming at high tide to rise from the waters of the bay itself. A few years ago, a Washington Post reporter, David A. Fahrenthold, chronicled its collapse. A simple matter of rising sea levels affects us all and is therefore political. Somehow, Mr. Gillis seems unable to keep clear in his own mind the relationship between the sinking of the land , erosion of sand bars, and the rising of the water itself. Chesapeake sand bar islands are famous for coming and going historically, it is no surprise to local Chesapeake watermen. Aside from this general sinking of land up and down the East Coast, some places sit on soft sediments that tend to compress over time, so the localized land subsidence can be even worse than the regional trend. Much of the New Jersey coast is like that. The sea-level record from the Battery has been particularly valuable in sorting out this factor, because the tide gauge there is attached to bedrock and the record is thus immune to sediment compression. It is simply not possible that a New York-based environmental journalist of the stature of Justin Gillis, who has been writing on environmental issues in and around NY City for so long, who has stood at the Battery and talked to the scientists who operate the tide gauge there, could be unaware of the continuously operating GPS system of the National Geodetic Survey which is being used to carefully the measure the ups and downs, norths and souths, easts and wests of the Earth’s crust. We know precisely (as precisely as we will ever know) how much the Battery has sunk in the last 50 years. All he had to do was ask. 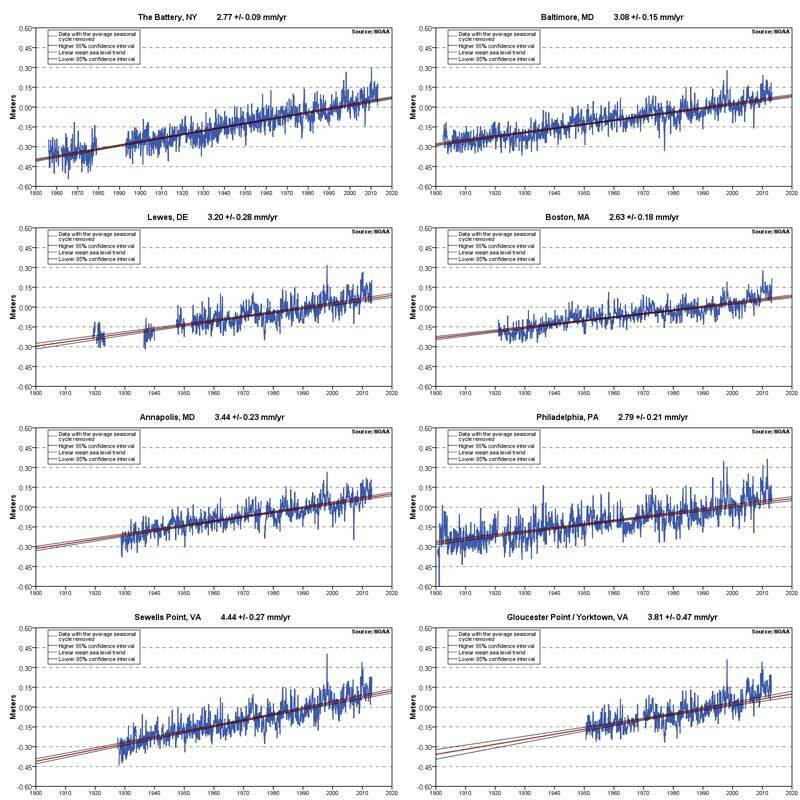 The latest subsidence numbers for the Battery, NYC come from this paper Using global positioning system-derived crustal velocities to estimate rates of absolute sea level change from North American tide gauge records by Richard Snay et al. at NOAA NGS who calculate a long-term geological rate of 2.2 mm/yr. By the way, Richard Snay was very responsive to my email requests for data and pointers to sources of information – which was welcome as the CORS website was a bit confusing for those not initiated to its complexities. The last house on Holland Island in Chesapeake Bay, which once had a population of almost 400, finally toppled in October 2010. As the water rose and the island eroded, it had to be abandoned. Did I mention already that the neighborhood being bemoaned in Portsmouth, really, across the river from Norfolk proper, is a drained and filled swamp? that it has been sinking and flooding for years and years? that everyone there knows why this is so? The tides wash in through the fill and wash out the soil underlying the neighborhood, especially the road shown in the photo in the NY Times article. I’ve stood on that very spot twice, six years apart, anchored in the bay to the right of the photographer. Both times they were repairing the same street, the same seawall, for the same reason. Up and down the Eastern Seaboard, municipal planners want to know: How bad are things going to get, and how fast? One of the most ambitious attempts to take account of all known factors came just a few weeks ago from Kenneth G. Miller and Robert E. Kopp of Rutgers University, and a handful of their colleagues. Their calculations, centered on New Jersey, suggest this is not just some problem of the distant future. This study (follow the link if you like) is quoted as follows: “A largely anthropogenically driven global sea-level (GSL) rise of 20cm during the 20th century [Church and White , 2011] caused Sandy to flood an area ~ 70km 2 x greater than it would have in 1880, increasing the number of people living on land lower than the storm tide by ~ 38,000 in New Jersey and by ~ 45,000 in New York City (Climate Central, Surging Seas Data Table, 2012, retrieved from SurgingSeas.org/downloadables, based on methodology from SurgingSeas.org/NationalReport, last updated February 2012).” I have already given the data from the IPCC that AGW sea level rise didn’t even begin until 1970 (not the entire 20th century as claimed), in a separate essay, I showed that Hurricane Sandy’s storm surge was not made more destructive by AGW. The data which Miller and Kopp have “retrieved” came from that bastion of scientific truth, ClimateCentral — SurgingSeas.org returns http://sealevel.climatecentral.org/ . People considering whether to buy or rebuild at the storm-damaged Jersey Shore, for instance, could be looking at nearly a foot of sea-level rise by the time they would pay off a 30-year mortgage, according to the Rutgers projections. That would make coastal flooding and further property damage considerably more likely than in the past. Even if the global sea level rises only eight more inches by 2050, a moderate forecast, the Rutgers group foresees relative increases of 14 inches at bedrock locations like the Battery, and 15 inches along the New Jersey coastal plain, where the sediments are compressing. By 2100, they calculate, a global ocean rise of 28 inches would produce increases of 36 inches at the Battery and 39 inches on the coastal plain. These numbers are profoundly threatening, and among the American public, the impulse toward denial is still strong. But in towns like Norfolk — where neighborhoods are already flooding repeatedly even in the absence of storms, and where some homes have become unsaleable — people are starting to pay attention. The entire point of this essay is to point out that, with the exception of a few obligatory “Another Scary Movie”-type inclusions of very iffy speculative numbers concerning the far future or the well-known general whole world historical sea level rise number, Mr. Gillis simply left out numbers, actual quantitative figures, all together. Had Mr. Gillis taken the time and effort to gather even the simplest of basic numbers and present them to us, we would have known where to concentrate our efforts in regards to the sea level rise problem here on the East Coast of the United States. I present this information in two simple posters, cartoons, if you will, showing 50 years of data. The data is for the Battery, NY City. It would be even more dramatic for Portsmouth/Norfolk, VA.
Sea Level Rise from AGW – The Battery, NYC – last 50 years. Unknown, but Mr .Gillis warns us over and over to expect the worst. Once we do the numbers, we’ll know the truth. 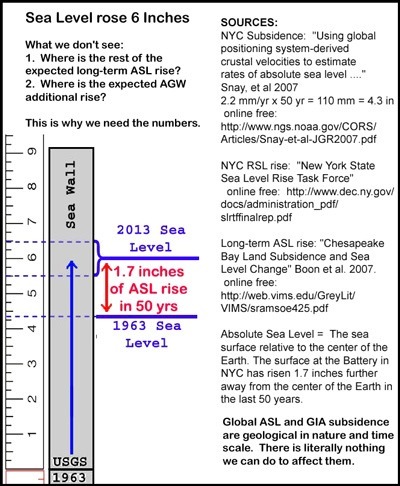 Relative Sea Level – The Battery, NYC – last fifty years. Source: New York State Sea Level Rise Task Force Report to the Legislature — Dec 31, 2010 “New York Harbor has experienced an increase in sea level of more than 15 inches in the past 150 years, with harbor tide gauges showing a rise of between 4 and 6 inches since 1960.” I use a figure of the full 6 inches sea level rise over the last fifty years, to prevent senseless quibbling. AIG Subsidence – The Battery, NYC – last fifty years. Source: Using global positioning system-derived crustal velocities to estimate rates of absolute sea level change from North American tide gauge records by Richard Snay et al. at NOAA NGS. This paper gives a long-term -2.2 mm/yr vertical movement as the mean of five different groups’ calculation methods of the data, for a net 4.3 inches of land sinking since 1963 in two simple posters. Now you know too. Wasn’t that easy? Moderation and Commenting Note: This essay is not about CAGW, AGW, GW, CCC, CC, or any combination thereof. It is about journalism, poor and dodgy. I would like to hear from Justin Gillis and would like to apologize to him if I have misrepresented his NY Times piece. It is about sea levels on the East Coast of the US and the components of their rise. I’ll be glad to answer your questions in that regard. I have sailed and anchored at most of the locations mentioned, including the very harbor pictured in the NY Times article in Portsmouth, VA (though it is labeled Norfolk). The new home of Hobart’s Institute for Marine and Antarctic Studies (IMAS) has been officially opened. 40 per cent of the world’s Antarctic researchers will work from the building. It has been more than four years since the previous federal government committed to build the $45 million centre on the waterfront. If the IMAS were concerned about sea level rise, why build ‘on the waterfront’? The floods in the UK are a direct result of interference by EU bureaucrats who mostly have never had a proper job. They have declared that all silt in rivers be designated ‘toxic waste’. As such all silt dredged up above the surface must be disposed of in approved sites. The cost of doing so is horrendous and quite impractical and hopelessly uneconomic and so dredging the rivers has stopped. Hence the rivers cannot carry the excess water and so overflow their banks. The trends plotted all remain completely immune to emissions, as is true of nearly every individual tide gauge in the world. His not pointing this out in his years of reporting is a lie of omission that directly enables a massive economy destroying fraud that represents whole governments turning into Enron. Well done Mr. H. Thank you. Maybe if they looked at the chart for Alemeda in San Francisco Bay, they might get a different view. No sea level change in something like 60 years. None, nada, zip, zilch. First rule in journalist school, NEVER write a number. The reason that they get taught this is probably that people who want to become journalists to change the world are generally not the type of person that can cope with numbers. Whether Justin Gillis can I don’t know but he has obviously been conditioned to not use numbers. That makes MSM so useless. That and the lying. I did not tell lies, I was merely being economical with the truth. As asked before, why did Al Gorical buy $4M worth of sea-front property a few years back on his Inconvenient Truth profits if he “knew” sea-level was going to rise so inexorably? Words fail me, well polite ones anyway! We lived in Norfolk from 1981 to 1993 and have visited many times since (we now live 90 or so miles away, near Richmond). From 1982 to 1991 I sold real estate. One of the disclosures I had to make to buyers was about flooding, for which certain neighborhoods (Colonial Place, e.g.) were notorious. We all knew that Willoughby Spit, on which many thousands of people now live, some in swanky and expensive homes or condos, was formed by a 19th-century hurricane. What one hurricane can make, another can unmake. The famous Ash Wednesday storm [1963, I think; not a hurricane; midwinter] swept well over a dozen miles inland and reshaped the Atlantic shore from the cape well into North Carolina. [By the way, Paul Fraim, Norfolk’s mayor, had begun his public work before we left; he seems an intelligent and sensible person.] Sometimes a good strong rainstorm could flood many neighborhoods at once: one of my more vivid memories is driving through one such storm and seeing police cars and a city bus floating sideways down Brambleton Avenue; my own car was flooded, and I had to wait for the water to subside a bit before driving it home. It was never the same after that. Norfolk has many large, heavy buildings, which I understand have sunk measurably since construction. I welcome the article above; it is a necessary corrective for all the hype. In the year 1749, a student of Linné cut a water-level mark on the cliffs at Ratan. That mark is now 8 feet above sea level. There are almost no tidal movements in the Baltic sea. Can we please have some funds? And of course the (common) pumping of groundwater causes the land above it to subside. I am concerned for our nation’s capital. We should not wait for disaster, but should move the seat of government to the heartland, far from any sea level danger. Moline, Illinois would be ideal. The global map of sea level rise is in almost perfect accord with the ENSO effect of shifting warm water to the western Pacific around Indonesia Papua New Guinea etc as advised in Fig 3-10 of Bob Tisdale’s ENSO Basics post last October. He has actually been on the seen and collected real data over many years! Low information journalist writing for low information readers. I have seen this said in one or two places recently, but I have yet to see proof of it, though I tend to think it could be true. Does anyone have the data to prove it? I have never read a paper which indicates how much sea level rise is due to displacement, solids from shorelines, new rocks from volcanoes and silt etc from rivers. These solids added to the ocean must displace water and therefore raise levels. In essence all solids are on their way to the ocean, the rocks on the highest mountains will eventually make it to the sea. Does anyone know of a number that descibes this effect? That’s a good point. How much erosion ends up in the oceans by volume displacing water and causing sea level rise? Tim Churchill says at January 27, 2014 at 3:46 am..
A quick google gives the answer “it’s not entirely true”. • 170506 – dredging spoil (other). However, the rules for 170506 are also strict – it must go back nexyt to the river where it was dredged from. And, as there is a fine distinction between 170505 waste and 170506 waste (17506 waste is not 17505 waste -?) then I would be wary of dredging a river without futher guidance from the Environment Agency. How do you know what has gotten into the river? Whether it is as Byzantine a bureaucracy in practise as on paper – I do not know. I did not read it all, but dredging in the EU sure looks like a delicate operation, legally speaking. A government minister is visiting the flooded Zummerzet Levels at this moment. I watched the BBC News Channel in amazement as he tried to excuse the stopping of dredging which the locals are certain has caused the flooding. And when he finished I immediately read your comment. It seems that the direct reason for the cessation of the dredging is that the Environment Agency won’t pay for it. In the past local people cleaned ditches and rivers to avoid flooding. Indeed, the lack of such cleaning (i.e. dredging) during WW2 induced the 1952 Lynton and Lynmouth flood disaster ( http://en.wikipedia.org/wiki/Lynmouth ) the need was acute. But EU legislation on potentially toxic waste now prevents the locals from clearing drains and rivers themselves. The dredged muck is classified as potentially toxic waste so cannot be left on the riverbank (and add to containment of the river) but has to be disposed at high cost. The local authority and local people do not have the money to do this. The problem is especially acute in the Somerset Levels where all the waterways are man-made so need to be kept clear by man. EU legislation about trees also increases run-off and so increases the probability of rivers overflowing. I would have thought that this would make the sea level changes appear smaller, as the rebound would cause the land to rise and the seabed to fall. Or was all this ice in the seas ? NO. If it is anywhere in Illinois, the gangsters in Chicago will make it into an even worse nightmare than it already is! Put it across the river, but no closer to Chicago or leave it alone. The thought of the amateur corruption of DC combined with the professional corruption of Chicago is one to cause nightmares. One the one hand erosion on land causes sedimentation in the seas, mainly on the continental shelves. On the other hand plate tectonic movements cause the ocean basins to increase in size. Similarly long term cooling of the oceanic crust after it is formed at the mid-ocean ridges causes this crust to sink as it ages. Then there is pumping of water from fresh water aquifers on land, water that ends up in the sea, raising its level. 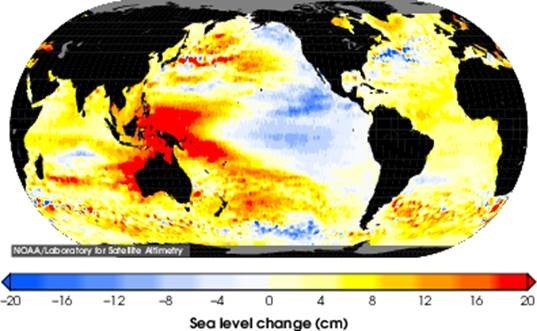 Clearly numerous factors contribute to change in mean sea level. On the balance of evidence it does appear that sea level has been rising over the last several decades. Part of this rise could be due to global warming. I suspect that erosion on land leading to water displacement is a minor contributor but I don’t know for sure. “I am concerned for our nation’s capital. We should not wait for disaster, but should move the seat of government to the heartland, far from any sea level danger. Much better if we moved all of them to Windsor, Ontario. (with sympathetic apologies to our Canadian friends). In some areas the result of the massive weight of a continental scale ice sheet is to depress the crust, particularly under the ice. But for every action there is an approximately equal reaction. In areas surrounding the ice sheet the crust bulges up. When the ice sheet melts way the depressed areas rise. At the same time the pro-glacial bulge sinks. This is all related to the tendency that the earths crust has to flex under compression, which is accommodated by flow in the “plastic” mantle beneath. The growth of an ice sheet forces the mantel to flow outward in a somewhat radial pattern. Shrinkage of an ice sheet causes the process to reverse. immediately drew my attention to the area depicted in the red. It shows slowdown in the tectonics, i.e. sea floor may be settling downwards (manifested in an apparent sea level rise) from the previous period of high tectonic activity and a possible magmatic uplift. Just a speculation. Then there is Boston, MA another Harbor town. Asa Sheldon makes the whiners look like the wimps they are. This is a present day map of the area. link As far as Hubby can tell the area filled in by Sheldon is north of Causeway Street (see green arrow) and west of I 93 in the vicinity of Boston Garden (now called TD Garden) and North Station. …The commencement of this monster job was in May. The first shovel full of dirt was thrown out on the morning of May 5, between 7 and 8 o’clock; and the last shovel full on Oct. 5, between 7 and 8 o’clock in the morning. Someone should make Justin Gillis read Yankee Drover out loud to the rest of the NY Times staff so they know what the words Yankee Ingenuity really means. It has nothing to do with baseball guys. Modern science reporting, as demonstrated in the NYT essay, is seldom about actual facts and figures. NOVA suffers from this same deficit. It is clearly deliberate and is typically used to deceive the reader. You’d be correct. That is apparently why all the sea level rise figures we see already have 0.3 mm/year of GIA (glacial isostatic adjustment) added to them … to account for this ocean bed sinking/enlargement. I, for one, do not see why it is always included … surely the need is to know the sea level figure relative to the land mass you are sitting on, not what it would have been had the seabed been stable. I am fond of citing the underwater archaeological work off the Isle of Wight, a site remote from orogeny, subduction, or earthquake zones. Local geological effects are not expected to be large. Offshore from Bouldnor, Isle of Wight, divers have found at 11 metres (36 ft) depth the submerged remains of a wooden building that was built there on land around 6000 BC when the sea level was lower. In any case, a 36-foot rise of relative sea level on 8000 years (post glacial) is a *long-term* average rise of 5.4 inches per century (1.375 mm/yr), most of which has been totally devoid of anthropogenic climate effects. The sea level has been rising at a rate comparable to the currently measured rate since before the earliest historical records, and we have somehow not endured the ‘expected’ inundations – maybe because people can move faster than the sea level. Why Windsor, Ontario and not London, Ontario, or even London, England? My Husband found an on-line addition of Yankee Drover or ASA G. SHELDON, WILMINGTON FARMER IN TWO ARRANGEMENTS Asa was born in Lynnfield, Mass., Oct, 24th, 1788 and moved the top of Pembroke Hill in the spring of 1835. With luck my first comment will come out of moderation sooner rather than later so this makes sense. Nah, Detroit. If Obama had a city it would be Detroit. So I am sure the politicians would feel right at home. The mean sea level trend is 0.82 millimeters/year with a 95% confidence interval of +/- 0.51 mm/yr based on monthly mean sea level data from 1939 to 2006 which is equivalent to a change of 0.27 feet in 100 years. However, the change at Alameda differs significantly from that at San Francisco, right across the bay. Combining the two, they might indeed get a different view. When he says “the best calculation” he is referring to the long-term overall global sea level rise believed to result from the Earth’s recovery from the Little Ice Age, or Global Absolute Sea Level , Global ASL, and widely accepted to amount to roughly 1.8 mm/yr pre-1960, and a bit more, up to 3.2 mm/yr, since then. You get the widely accepted 3.2 figure from where? Colorado University’s Sea Level research Group? First off, they tell you right there in the fine print that they’ve added 0.3 mm/yr in order to make their chart a proxy for ocean volume, not sea level. So it’s really only 2.8 mm/yr. If you download the 20 years of data they have there and compare the first 10 years with the last 10 years you will see that the current 10 year rate is only 2.8 compared to 3.6 mm/yr for the first 10 years. But wait, do you ever remember the satellite data reporting 3.6 mm/yr back then? A quick trip to the Internet Archive’s WayBack Machine allows us to look at the old data and you know what? It was only 2.6 mm/yr not 3.6 mm/yr. That’s right, Colorado University has re-written/corrected the historical data to the tune of adding nearly 1 mm/yr to the rate for those first 10 years. One has to wonder if the editing and correcting is valid. If not, the rise these last 10 years is only 1.8 mm/yr which is in agreement with pre-1969 values and not one bit more up since then. Journalists, Justin Gillis included need to do some sleuthing rather than taking at face value what’s being fed to them by people who have a vested interest in maintaining scary scenarios for the cause. ….Some degree of sinking is going on all the way from southern Maine to northern Florida, and it manifests itself as an apparent rising of the sea. This is a mix up of two different geologic processes. One is isostatic post-glacial rebound the other is the movement of the tectonic plates. The west coast of the USA is rising and the east coast is sinking. This gives a bit about observations of tectonic plate movement. I have no idea if the theory has any merit. …”The earth’s surface is covered with tectonic plates that move with respect to one another at centimeters per year,” Schellart said. “These plates converge at deep-sea trenches, plate boundaries where one plate sinks (subducts) below the other at so-called subduction zones. The velocities of these plates and the velocities of the boundaries between these plates vary significantly on Earth.”…. This discovery explains why the Australian, Nazca and Pacific plates move up to four times faster than the smaller African, Eurasian and Juan de Fuca plates. “It also provides explanations for the motions of the ancient Farallon plate that sank into the mantle below North and South America. This plate slowed down during eastward motion from about 10 centimeters (four inches) per year some 50 million years ago to only 2 centimeters (0.8 inches) per year at present,” Schellart said….. The second passage below refers to “similarly high rates … between 1920 and 1950,” which makes me wonder exactly what the first passage below means by saying the pre-1960 was relatively low. It’s also unclear whether the last sentence in the following passage is intended to be the conclusion the author invites the reader to draw from its previous sentences. If so, the “between 1920 and 1950” part makes that conclusion questionable. IPCC enthusiasts will know that the IPCC’s latest statement on sea level rise is “It is very likely that the mean rate of global averaged sea level rise was 1.7 [1.5 to 1.9] mm/yr – between 1901 and 2010, 2.0 [1.7 to 2.3] mm/yr between 1971 and 2010 and 3.2 [2.8 to 3.6] mm/yr – between 1993 and 2010. It is likely that similarly high rates occurred between 1920 and 1950.” (AR5 SPM) and also “It is very likely that there is a substantial contribution from anthropogenic forcings to the global mean sea level rise since the 1970s.” We need to note here that the IPCC considers AGW contributions to sea level rise to start circa 1970 – not as often portrayed, at the beginning of the Industrial Revolution, in 1880 or 1890. Of course, readers could collectively spend many man-hours attempting to locate the data and possible resolve that question, but, if the author knows whereof he speaks, perhaps he could direct us to the data or otherwise dispel the ambiguity thereby forestall that waste of time. A motion of 10 centimeters a year!?! And they want us to worry about 3.2 [2.8 to 3.6] mm/yr sea level rise? I think they have the wrong end of the stick as usual but then you can not tax the movement of a tectonic plate or use it to control the population. perhaps he could direct us to the data or otherwise dispel the ambiguity thereby forestall that waste of time. Perhaps you could explain to us whatever ambiguity whereof you think you have found in the author’s clear statements. The land rises where the ice was, and the forebulge outside the glaciated area sinks. On the east coast the changeover point is near Cape Cod. You don’t even have to measure anything to see it, the structure of the coast is enough. The coast of Maine is a typical rising coast, while the coast south of New York with its many rias (drowned river valleys) and barrier islands is as typical a sinking coast as you can find anywhere in the world. For those of you concerned about silt waste disposal read this official guide. In general it’s not a problem. If contaminated then it might be. The other issue is the amount you can drop on the banks over a 12 month limit. In Somerset the main drain is the river Parrett. I assume the dredgers would dump the silt at sea. Mars (the planet) would be a better choice. I love the fact that the land at the Battery is subsiding at a faster rate, 2.2 mm a year, than the sea level is rising, 1.8 mm per year. That point should be made over & over again to show how ridiculous these scare tactics are. That’s what the AGW people do. They just keep repeating the same point over & over until they claim they have consensus for their idea & point of view. That would make sense but no. They have to deposit the silt next to the river. Presumably so as it is washed back into the river the next time it rains. and also the EA exemption for silt that isn’t contaminated. 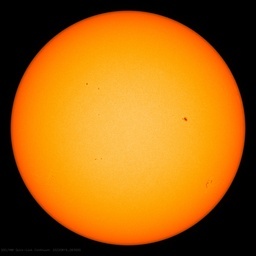 Matt not Mars, Venus, there the can experience so real global warming and actually have some hot air to compete with the hot air they produce. I nominate Vail, Colorado. Having smelled the pot smoke on those slopes before the state gave the stuff the green light, I think the federal government culture with mesh nicely with the local culture. Claims of accelerating sea level rise are utterly baseless and are an artifact of using satellites which haven’t been properly correlated to tide gauges. Detection of an AGW signal presumably requires a deviation from the long term trend, and probably even a way to determine a deviation from other natural influences. I’m not aware of any method to estimate the latter. Good article. It’s important to separate subsidence from sea level rise, and I agree that it’s inexcusable that Justin didn’t do that. Thanks for doing the work! The EU legislation on ‘silt’ being treated as toxic waste was supposed to deal with the run-off of chemical fertilisers and organic animal waste. The Somerset Levels are farmland and there is a lot of organic fertiliser spread there (colloquially refered to as ‘muck spreading’ since it is the discharge from bovine rear ends). The real problem with the EU legislation (which, in this instance was written by some idiot in Whitehall and eagerly pushed by the self-same environment agency that now refuses to deal with it) is that the EU legal system is incompatible with the UKs. So, anything agreed by the rest of the EU and dealt with sensibly and in a straight forward and usually commonsense manner, gets to Whitehall, is rewritten, gold-plated, given a few additional requirements, and then dumped on everyone in the UK as ‘The EU is making us do this’. The newspaper reports also ignore (as do the Local Authorities when they want to) the EA exemptions which, I suspect, resolve the problem in the levels and elsewhere. I spent my summers on the eastern shore of the Chesapeake as a child in the 1960s and 70s. Recently back there, I could notice no change in the level of the bay, but did notice ongoing erosion of the bluffs along the bay (which, of course, were formed by erosion in the first place). From time to time sea level comes up and various confusing numbers are brought out. Fact is, sea level is influenced by water held in storage and none of these guys bother to make the correction for it. The only people who did it right are Chao, Yu, and Li in a paper that appeared in Science on April 11th 2008. They corrected available values for sea level rise for all water held in storage by thousands of dams built since the year 1900. Sea level rise, so corrected, became linear for the last 80 years. The slope of this sea level curve was 2.46 millimeters per year. It works out to 24.6 centimeters or a little under 10 inches per century. I am betting that this is what we get by 2100. That’s right, Colorado University has re-written/corrected the historical data to the tune of adding nearly 1 mm/yr to the rate for those first 10 years. One has to wonder if the editing and correcting is valid. If not, the rise these last 10 years is only 1.8 mm/yr which is in agreement with pre-1969 values and not one bit more up since then. It’s UC’s equivalent of the effort to “cool the past”. Seems to be working and is largely unchallenged. It is always best to check a thread before asserting suspicions in support of your prejudice. I followed his link. The EA Exemption says all silt must be put on the river bank as close to where it was dredged as possible. Presumably this is to ensure that run-off returns the silt to where it was dredged! My question has to do with the basis for saying that the IPCC sees AGW influence in sea-level increases only after 1970. From the trends set forth in my last comment’s second quoted passage, one might be forgiven for inferring a trend of 1.1 mm/year between 1971 and 1993, whereas “similarly high rates”–which I take to mean 2.0 or 3.2 mm/yr–were said to have been experienced between 1920 to 1950. 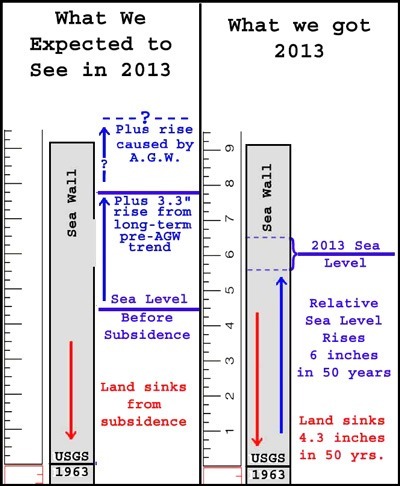 Are we to see an AGW signature in this apparent fall in the rate of sea-level rise? If so, some explanation would be helpful. I favor Freeport. Lincoln and Douglas debated there. Or Eureka, Illinois. Loves Park has a nice sounding name. Galena is the home of US Grant. And it gives sufficient hint about the nature of government. Reply to Walter Dnes ==> “Note; “sinking” is *NOT* GIA.” Quite right. Not all sinking is GIA. Some sinking is GIA. There is GIA sinking along the East Coast of the United States south of the Central Hudson Valley of New York State. Reply to C.M. Carmichael ==> That would take a LOT of solids. I have no data, maybe some one does though. It is believed that the level of Lago Enriquillo is being raised by inflow of solids but the scale is entirely different. Reply to Neo ==> You are absolutely right…with a big BUT…as the ice forced the Arctic DOWN, it “hinged” the more southern portions of North American land mass to rise a bit. Now that the Arctic land mass sinks back down, relieved of its ice mass, the southern portions are sinking again, with the “hinge point” approximately at the mid-Hudson Valley in NY State. Reply to markx ==> About that “0.3 mm/year of GIA (glacial isostatic adjustment)” — ermmm — sort of. It is a different issue than the one being spoken of and illustrated here. I suggest going to one of the good sea level sites like http://sealevel.colorado.edu/ for a full explanation. Reply to crosspatch and slayton ==> May I suggest that the two of you do the work. Collect up the figures for subsidence and RSL rise, do the simple addition and see what’s up. The tidesandcurrents graphs only shows relative sea level. You needs land subsidence or rise data to know Absolute Sea Level change. If the land sinks more-or-less equally to sea level rise, you will see a level tidesandcurrents graph. See the link to the CORS GPS data in the essay. Reply to Steve Case ==> No quibbling, sir. Reply to Joe Born ==> The longer statement in quotes in the essay itself is from the IPCC 5th Assessment…it ends with (AR5 SPM). Your shorter quoted portion are my words. The 1.8 mm/yr figure is that generally used in the field for long term global absolute sea level rise due to recovery from the Little Ice Age prior to the advent of AGW. For the illustrative purposes of this essay, no quibbling. Reply to those with a Sincere Concern for the safety of our Blessed National Capitol ==> It touches my heart that and brings tears to my eyes that so many share my pain and fears. away from storm surges, hurricanes, floods. It should be a city already with a large federal presence. It is a green choice. When people leave office, their next term is served just down the road. Terrific essay Kip. One point I didn’t see that really is important is that even if sea levels weren’t rising and some land wasn’t sinking, the human race has been building much too much vulnerable infrastructure in places that it really should not be built. When, as must inevitably happen, the infrastructure is damaged or destroyed, the blame is clearly on human beings, but blaming the problems on “climate change” is mostly a cop out. The problem rather, is largely bad judgment — past and present. And the cure is probably mostly more realistic planning, zoning and construction practices — plus hardening or removing stuff that is in places where it will not survive. On average, zero. As John Wesley Powell surmised, the Colorado River has maintained a fairly constant elevation over the last 5 or 10 million years while the Colorado Plateau rose above it, creating “Split Mountain,” the Grand Canyon and others. As the the mountains and plateau erode away, the land rises to compensate. Ocean basins can’t grow without raising land on the continents. For fun, consider the “urban sea level effect.” Skyscrapers weigh quite a bit, raising the geoid several meters. This is countered just a little by mass removed from subway tunnels. While Shanghai has dropped 2 meters in the last century due to being built on delta sediment, NY is built on solid granite. Even so it must be subsiding slightly due to the mass of the structures built on it, but I’ve never seen the effect quantified. At any rate, tide gauges have tended to be placed near cities, where the mass of buildings, besides settling the ground, even attracts the water (like huge sea mounts), raising local sea level slightly. Not significantly, but I’d still like to see some figures. Capitols of countries (particularly the US) should be as far from pleasant and scenic areas as possible. Building should be concrete block and painted an ugly haze gray. No restaurants only fast food places and motels will do fine for housing. Make it so they demand to go home frequently and for long periods and are reluctant to return. Kansas would be good for placement of DC. What I find refreshing is that despite all the claims for global warming climate change causing the floods, the locals have not been taken in. They blame the lack of dredging. I also blame it being a floodplain that’s below sea level. Kip, thanks for the article. Until today I had not realized that the Glacial Isostatic Rebound was sinking New York City. I understood that NYC was part of the plate that was rising, I.e. north of the hinge line. SLR, which started in the late 1700s and had its biggest decadal increases before the 1860s, must be the lamest of all climate beatups. Yet they keep beating it up. Maybe the President did slow the rise of the oceans…President Buchanan, that is. The article, and especially the posters at the end, are a very good refutation of the NY Times pseudo-science. Reply to Don K ==> Quite right, Slim. It is incredibly stupid to build cities full of hotels and casinos on sand bars. I live on one now (well, the marina where we tie up our boat is on Cape Canaveral, which is a barrier sand bar, historically prone to being washed hither and yon). Equally true of 100 year mud flats and flood plains, areas below sea level, etc. This is not news to the human race — it is a so well-known foolish tendency, it is mentioned in the Old Testament of the Bible. I write to provide a reminder – especially to non-Brits – of the clear message which needs to be presented to politicians and is provided by the flooding of the Somerset Levels. The Levels were a swamp that was completely flooded most of the year except for a few, small islands. Indeed, it was by hiding in the levels that Alfred the Great ended up burning the cakes because searching the reed-covered marsh was impossible. The Napoleonic Wars provided a need for additional grain and one response was to drain the Levels to obtain additional farmland. This conversion of the swamp to agricultural land was conducted in the period 1770 to 1833, and this paper describes it. The drainage and water management are relatively recent and entirely man-made. The Levels will return to being a flooded swamp in the absence of proper maintenance and operation of the drainage and water management. So, the people who live on the levels KNOW they will be flooded if that proper maintenance and operation ceases. And they know the necessary dredging of the watercourses has been stopped. Arguments about climate change and conservation are rejected by people who know their homes will be destroyed unless the dredging is conducted to ensure operation of the man-made drainage. People who are faced with real threats to their homes and lives will reject politicians who use political scares as an excuse to ignore the real threats. It strikes this follower in SW England that what really matters with Sea Level is of less importance than whether a very strong onshore storm force wind is blowing at the time of a high Spring Tide. That’s what causes the trouble as we had here on the East Coast last month and worse in 1953 and many times recorded in previous centuries. The British Ordance Survey tell me that they use the mean sea level datum point of Newlyn Harbour in West Cornwall in calculating contours of the land maps of the British Isles as they have done since 1921. Reference the West Country flooding…just listened to an affected farmer saying that in past times they dredged and spread the silt beneficially on the local fields..this is no longer allowed and the silt has to,be so close to the river that the next rain washes it all back in.The Environment Agency has spent many millions on a new bird sanctuary at the end of the river they cannot afford to dredge!! “Well, Mr. Avenius, what to you think?” I ask, addressing one of the brainiac ‘tweenage scouts, “mistering” him for good effect. Drawing himself up to his full four-feet of majesty, young Mr. Avenius pronounced, in his best faux-British drawl “As the rising sea seems to be a combination of sinking land mass and sea rise resulting from conditions beyond our control, I think we are in for trouble on the double.” performing a curtsy at the end, resulting in general hilarity. It is intriguing that in an article about journalistic accuracy and integrity that the author, and later commentators, use expressions that are very ambiguous, even inaccurate. Mention is made of Jersey, which to my mind is an island in the western English Channel just off the coast of the Breton Peninsula. Perhaps the author was referring to New Jersey? Other commentators refer to Richmond (a market town in North Yorkshire), Norfolk (an English county famous for its man-made waterways and infamous for its University of East Anglia). It is probably best to refer to the original without qualification, and all others with. Where there is doubt as to the original or when it is a case of common but unrelated naming, to then give a qualification. For example, which came first, the River Don in Georgia (that’s in the Caucasus) or the River Don in Scotland? Accuracy and specificity is important in science, reporting and criticism. A couple of years ago I watched a Discovery program on Lake Michigan. The south end is rising, albeit slowly, and the north end is sinking, like about 10 feet in a century. This is a result of the Laurentian Shield rebounding from the mass of melted ice. No way you can blame that on carbon emissions. Meanwhile back in the UK, the sea gate of Harlech Castle built 700 years ago is now about a kilometer remote from the sea. Blame that on global warming? It is intriguing that in an article about journalistic accuracy and integrity that the author, and later commentators, use expressions that are very ambiguous, even inaccurate… Accuracy and specificity is important in science, reporting and criticism. This is what Robert H.Thouless in his book “Straight and Crooked Thinking” called the fallacy of irrelevant objection. This was a good essay. Thank you, Kip Hansen. BILL: What’s the matter with that dude? BABE: I wanna go to bed! BILL: Ah, my bony boy! In the Estonian Mountains, we used to go to sleep leaning up against a wind-fall. I was but a mere pratt then. I’ll never forget the time a snake slithered into my wife! I wasn’t but knee-high to a married grasshopper then. Never saw the woman again…. BABE: No, no! That’s all very interesting, but the sun is going down! BILL: Oh, no, no! You are confused! The horizon is moving up! BABE: Hey, listen! Come on, you guys! Help me, please! ALL: Stand him on his head! BABE: Hey, hey! Put me down! SOUND: They struggle with Babe. OLD MAN: Now, you see? Now it’s morning! DR DOG: He’s no fun. He fell right over! How much do the buildings of New York weigh? Reply to Richard of NZ ==> As for your complaint about “Jersey” — in my essay, the NY Times’ Mr. Gillis is guilty as charged in one instance in the sentence “People considering whether to buy or rebuild at the storm-damaged Jersey Shore,” though he might be excused by context. Additionally, to New Yorkers (remember, Mr. Gillis is writing in the NY Times) the term “Jersey Shore” refers specifically to the stretch of barrier islands along the eastern shore of the State of New Jersey). I am found guiltless. If you are referring generally either to the original NY Times article or my essay about that, the subject matter is sea level rise along the Eastern seaboard of the United States. I hope that narrows it down for you. In that context, Norfolk, VA is an important seaport which comprises a massive naval yard at the southern end of the Chesapeake Bay. When I find myself somewhat adrift with unfamiliar geography, I call up a locality map for reference. Neither Mr. Gillis of the Times (that’s the NY Times) nor I are responsible for the geographical ambiguity of WUWT commenters. Reply to yirgach ==> I haven’t heard anyone quote the Firesign Theatre for years! Thank you. Reply to Mellor and tty ==> Try the NGS CORS site, I’ve given the link a couple of times, and check the data for + or – vertical movement at each end of Lake Michigan. The data will be there. Good luck. Of course, tty, it is the land itself that is shifting up or down,the water is just sloshing around as a result. Always good to be clear about such matters though. It is incredibly stupid to build cities full of hotels and casinos on sand bars. not if you can find a buyer that will pay a premium for a water view. Probably need to move it a lot further to avoid disaster. Looking at the national debt, hard to see that much capital remains. It is my belief that is societally immoral to allow such things to eat up our national resources. If developers wish to risk their own capital (ref: your other cute remark), so be it, but they should not be allowed to risk tax payers dollars (through such dodges as federally guaranteed disaster insurance or flood insurance or hurricane insurance or whatever other public trough scams they come up with) nor tax payers lives by federal- or state-encouraged development of categorically unsafe environments. For fun, consider the “urban sea level effect.” Skyscrapers weigh quite a bit, raising the geoid several meters. This is countered just a little by mass removed from subway tunnels. While Shanghai has dropped 2 meters in the last century due to being built on delta sediment, NY is built on solid granite. Even so it must be subsiding slightly due to the mass of the structures built on it, but I’ve never seen the effect quantified. Excellent idea except North Dakota might even be better. by 2050. (Six or seven inches) hardly a flood.In Cairns up north, the tides flow down the gutters on the main street. Now if they suffered a Tsunami think what effect that would have? And Flim flam Flannery owns a cottage on the Hawkesbury River, and the easiest access is by boat. I know as decades ago I was thinking of buying it but access by a bush track was not feasible, not with a baby and having to work each day in Sydney. Mr. Gillis lays it, quite correctly, on the line: The land is sinking and the sea is rising. The oddest thing is that, although the scientists have spent a great deal of time and effort to quantify the amount of sinking and the amount of sea rising, Mr. Gillis doesn’t tell us, except in the vaguest of manner, either number. A friend of mine who used to be a financial adviser was asked to write for a local paper, he did the first article and the paper misprinted all his figures so next week he tried to correct them, the following week he tried again and the week after he gave up and told the paper that he would not be writing any more as they could not get the numbers right. They just accepted it as if they weren’t bothered. James I can identify with this, as far as the media is concerned the truth should not interfer with a good story. The thought of the amateur corruption of DC combined with the professional corruption of Chicago is one to cause nightmares. Mea culpa….I find I had quoted a secondary source, who had been quoting from from memory but not (substancially) changed the meaning. I am truly sorry. Do as I say, download a copy and use to to check the original source! There have been several comments about plate tectonics. Does anyone have any idea as to the magnitude and sign of the change in volume of the ocean basins that is caused by shuffling the continents around? Is plate tectonics a ‘zero sum’ game when it comes to the volume of the ocean basins? One millimeter of sea level rise corresponds to a decrease in total basin capacity of around 360km^3, an increase in ocean volume of 360km^3, or some combination of both. We know that undersea discharges of magma, hot water, and who knows what act to raise sea level. Other positive contributors to sea level rise include the discharge of silt, erosion of seashores moving material from the shore into the ocean, melting of ice caps and glaciers, pumping of aquifers, constant ‘rainfall’ of plankton and other organic material from the surface to the sea floor, and probably several other things I haven’t thought about. Do we have a rough idea as to the magnitude of all the material being injected in to the oceans, from whatever sources? What portion of the observed sea level rise can be attributed to physical changes in the size and shape of the sea basins and by them simply being ‘filled up’ by a variety of ongoing processes?